William Morton Kahan (born June 5, 1933, in Toronto, Ontario, Canada) is a mathematician and computer scientist whose main area of contribution has been numerical analysis. Among his colleagues he is known as Velvel Kahan. He attended the University of Toronto, where he received his Bachelor’s degree in 1954, his Master’s degree in 1956, and his Ph.D. in 1958, all in the field of mathematics. Among his many contributions, Kahan was the primary architect behind the IEEE 754-1985 standard for floating-point computation (and its radix-independent follow-on, IEEE 854) and developed the Kahan summation algorithm, an important algorithm for minimizing error introduced when adding a sequence of finite precision floating point numbers. When Hewlett-Packard introduced the original HP-35 pocket scientific calculator, its numerical accuracy, in evaluating transcendental functions, for some arguments, was not optimal. Hewlett-Packard worked extensively with Kahan to enhance the accuracy of the algorithms, which led to major improvements. 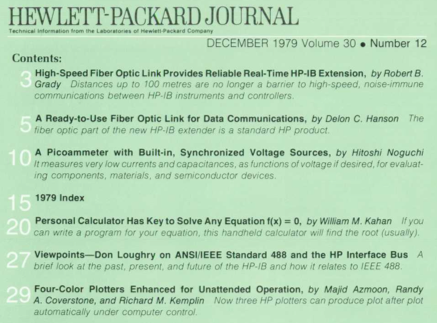 Prof Kahan’s contribution in Hewlett-Packard Journal, 1979.